The party game that will rock you! BOOM-BOOM, CLAP! BOOM-BOOM, CAP! We will, we will... Rock the Beat! In this outrageously funny party game, everyone starts banging and clapping to this famous beat. Each player is given a unique hand gesture that they must watch out for and if an opponent makes that symbol instead of the clap in the beat, you must respond with that gesture and then one of another player's. It may sound easy, but wait until you're rockin' our with multiple hand signs and laughing too hard to keep the beat! 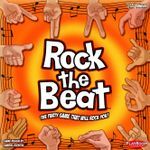 In Rock the Beat, the more, the merrier, so get a group together and find out who truly can rock all night and party every day! Contents: 36 Gesture Cards, 10 Penalty Cards, 2 Quick Start Cards and Instructions.